Tom Napper has been a professional musician since 1979 performing traditional music and song with tenor banjo, mandolin and octave mandolin. After early days in the folk clubs around Reading, he moved to Leeds in 1973 and immediately became involved with the University Folk Club. Immersing himself in the vibrant Irish music scene of the time, he joined in the many music sessions in the Regent and the Roscoe, two music pubs now sadly demolished. It was here that he met for the first time many of the musicians with whom he was later to work. Throughout the years of the early 1970’s no opportunity was missed to listen to and learn from the many fine musicians passing through Leeds and he built an extensive repertoire while developing great technical skill and deep understanding of the music. He made his professional debut in partnership with Alistair Russell, when, in January 1979, they began touring the folk clubs of Britain. 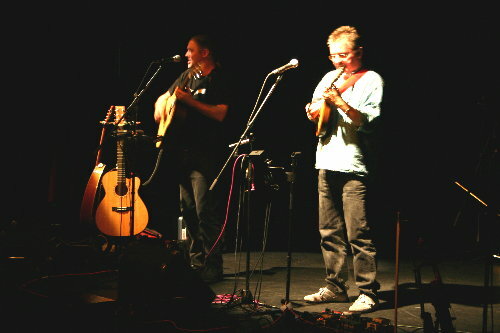 Now based in Middlesborough, the duo played extensively throughout the north of England, the Midlands, Ireland and Scotland, as well as trips to Brittany and Germany. At this time they recorded their LP Tripping Upstairs on the Celtic Music label. 1983 saw the formation of a new group, Dab Hand, with fiddle player Tom McConville and singer/songwriter Jez Lowe. Together they mixed traditional music and song with Jez’s writing to great effect. When Jez moved on, guitarist and flute player Gordan Tyrall was a natural choice to augment the band. Once again extensive touring took them the length and breadth of Britain from Jersey to Orkney, to the Netherlands, Italy and the USA. Their 1985 LP High Rock and Low Glen met with great critical acclaim. After their ‘retirement’ in 1987 the band played several reunion tours. Tom joined with singer and guitarist Rob van Sante in 1988 to form Real Time. The duo played folk clubs and festivals, as well as taking their music to challenging pub audiences. They recorded and produced the cassette So What Is There To Show? in 1994, and were invited to play at the Jacobs Ladder Folk Festival in Israel in 1995. Tom teamed up with an old friend, banjo player and singer Tony Wilson from 1994 to 1997 to play as Barnstormer. Joined by fiddle player Gina Le Faux and bodhran player Ciaran Boyle in 1999. Tom continued to perform widely as Napper, Le Faux and Boyle, then with Ciaran and guitarist David Kosky as The Idle Road. Recordings made by these combinations appear on Ciaran’s album The Sunday Walks. In 2002 Tom was approached by singer/songwriter Tom Bliss, the begining of a creative partnership. The combination of skillful songwriting and impressive musicianship, rounded off with powerful vocals proved to be a winner. Over the next 8 years they played in just about every folk club in Britain, and became festival favourites. Two CDs The Silverlode and The Kelping comprise the body of their material, while Tom Bliss’s Mixed Moss, Island Stories and The Whisper feature tracks by the duo. Collaborating with accordianist Chris Parkinson and multi instrumentalist Tony Taffinder, as The Pipers Sons, Tom N and Tom B recorded Stolen Pigs in 2006,and the band performed at Chippenham, Moor and Coast and Sidmouth Folk Festivals. Throughout his career Tom has played in numerous ceilidh and barn dance bands, notably Leeds based Old Chestnuts with melodeon player Martin Clarke. More recently he has collaborated with Scottish singer/songwriter Allan Johnston, and has played widely in the Yorkshire Dales with his good friend Peter Fleming as The Blethermen.